But there’s a more basic question that comes with this: Where do crystal properties come from? Who decides what a crystal is good for, and how do they know? While intuition is part of the answer, it’s far more complicated than that. The history of crystal healing and crystal magic goes back to a time before recorded history, and stones have helped people in every part of the Earth. Our problem in answering customer questions is deciding how to sum up a crystals metaphysical properties, neither ignoring history nor burdening our customers with a book’s worth of information. 1. Historical uses of the stone. In considering crystal properties throughout history and throughout the world, we look for common threads. The Chinese, Persians, and Aztecs may each have a dozen different ideas, but it’s the one they have in common that gives us the most to work with. 2. Intuitive impressions from trusted crystal experts. Here things get a little subjective. Anyone can look at a stone, hold it in their hand, and bring forth intuitive ideas about how it might be used. But how much of that is useful for anyone else, and where do you draw the line between intuition and imagination? There is no easy answer. But over time, certain experts have earned our trust, because many people have found them reliable. And when we compare their advice, again, we look for commonalities. 3. Chakra associations/color magic. Chakras are the figurative “wheels” of energy associated with the human body. The word comes from Hindu tradition, but the concept crosses cultural lines. 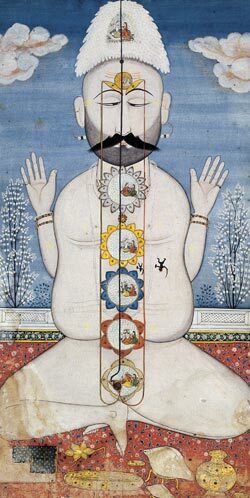 For modern purposes, when we discuss chakras we usually mean the seven energy centers that run from the base of the spine throught the crown of the head, each of which is associated with a color and an area of human experience and health. Simply by looking at a stone, anyone can know certain basic properties if they’re familiar with these color associations. When we advise people about how to work with a crystal, we’re drawing from all these sources. The hard part isn’t coming up with information, it’s knowing how to put all this knowledge into people’s hands without boggling their minds!